focus of Public Transport Safety Branch, with new security initiatives, a highly visible police presence and a rapid response to crime being just the ticket to derail offenders. The branch is at the forefront of strategies to combat graffiti and vandalism attacks on the state’s public transport network, with its proactive approach sending a clear message that violence, property damage and antisocial behaviour will not be tolerated. Another area on the front foot is Major Crime Investigation Branch whose tenacity and diligence in solving cold cases under Operation Persist come to the fore in the Jayson Doelz murder case study. The extensive investigation culminated in guilty verdicts for three offenders nearly six years after the murder, highlighting the vital role of Crime Stoppers and emphasising SAPOL’s commitment to unravelling complex cold cases. Also in this issue, we meet Sergeant Sam Wells, a Commonwealth Games fencing gold medallist who has successfully combined elite sport and a policing career. We then venture to the Eyre Peninsula to give Whyalla policing its moment in the sun and highlight the exciting careers on offer in the reborn ‘steel city’. Blueprint is licensed under a Creative Commons Attribution 3.0 Australia License . COVER Brevet Sergeant John Anderson in Kilsby’s Sinkhole at Moorak near Mount Gambier. Photo: Sergeant David Bacchus, Water Operations Unit. 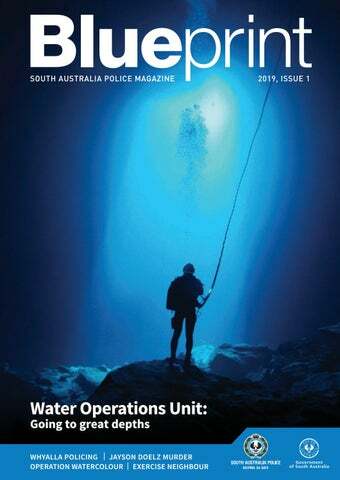 Views and opinions expressed by contributors within this publication are not necessarily those of South Australia Police, the Commissioner of Police or the Government of South Australia. 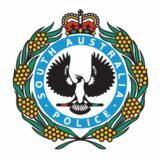 Articles, photographs and other contributions are welcome from every SAPOL employee. SAPOL treats indigenous cultures and beliefs with respect. To many communities it is disrespectful and offensive to depict persons who have died. Aboriginal and Torres Strait Islander communities are warned this publication may contain such images and references. THIS PUBLICATION IS PRODUCED ON PAPER FROM SUSTAINABLE FORESTS AND PRINTED USING ENVIRONMENTALLY FRIENDLY VEGETABLE BASED INKS BY GRAPHIC PRINT GROUP. People hear a lot about the Tour Down Under (TDU) and [...] Operation Nomad, but they probably don’t think about the logistics of such significant policing activities. Commissioner Grant Stevens with Sergeants Eamon Bull (left) and Brian Kitto. Photo: SAPOL Photographic Section. (POI) management plans, crime prevention activities and local and state command structures. High or significant risk POIs are actively monitored across every district and local service area during Nomad, and between November and December 2018 there were 106 police actions recorded, such as arrests, adult cautioning and expiation notices. Our commitment to these events and the professionalism displayed by all staff involved goes a long way to enhancing the vibrancy and safety of the state. These major activities are of course followed by ‘Mad March’ which carries its own unique demands on our services. I want to personally thank everyone directly involved – those behind the scenes and importantly, those who continue to fulfil the rest of our core functions to a consistently high standard. Disoriented and in complete darkness, Brevet Sergeant Glen McKenzie slowly and methodically searches through mud and silt at the bottom of the river bed. Brevet Sergeant Darian Leske recovers a firearm during a search. OPPOSITE PAGE: Brevet Sergeants Neil Innes and Glen McKenzie emerge from contaminated water wearing protective environmental suits. Photos: Water Operations Unit. BELOW: A team member dives into coastal waters. Photo: SAPOL Photographic Section. search or diving operation,” he said. “Every job is challenging in its own way, particularly those where we get away as a group and use the skills we’ve trained for.” Brevet Sergeant McKenzie is one of 15 members in the Water Operations Unit, a multi-functional specialist unit within Special Tasks and Rescue (STAR) Group. It was officially formed in September 1995 with the merger of the Underwater Recovery Section and Water Police. The close-knit group performs vital roles across the state including marine search management, underwater search and recovery, maritime policing (both commercial and recreational) as well as general operational policing. software called SARMAP which uses live information on weather, tides and winds to predict the movements of missing vessels, persons and objects. The unit is also suitably equipped to perform open-sea search and rescue missions with a fleet of four boats, ranging from a high speed inflatable boat used primarily for diving and shallow-water searches to the unit’s flagship, the 20-metre ‘Investigator II’, an all-weather patrol vessel used for long-range operations. “The unit’s extensive training and resources come to the fore during search and rescue incidents. We often coordinate large scale searches for missing people, working closely with volunteer marine rescue and the Australian Maritime Safety Authority along with air and sea assets,” Brevet Sergeant McKenzie said. The Investigator II patrol vessel, and above, with Brevet Sergeant John Anderson at the helm. Photos: SAPOL Photographic Section. There is a vast amount of experience within the unit, so I draw upon that wherever I can to increase my skills and knowledge. Brevet Sergeant Darian Leske in the River Murray at Cobdogla. Photo: Water Operations Unit. The two sides of Sergeant Sam Wells. OPPOSITE PAGE: Sergeant Wells (black top) coaching Australian team member Will Campbell. Photos: SAPOL Photographic Section. Having a successful elite sporting career prior to becoming a police officer can be a double-edged sword, but for Sergeant Sam Wells it’s worth its weight in gold. In this case, it’s the gold medal he won at the 2006 Commonwealth Games. Sergeant Russell Stone keeps an eye on the Southern Expressway. Photo: SAPOL Photographic Section. Driving at high speed along the Southern Expressway, the last thing a motorist expects is a rock or large missile indiscriminately hurled at their vehicle. Unfortunately the threat of this appalling and extremely dangerous behaviour was a reality for thousands of people during their travels on the main arterial route through Adelaide’s southern suburbs last year. Senior Constable Andron Abdul and SC1C Scott Allison patrol Honeypot Road, Huntfield Heights. Photo: SAPOL Photographic Section. ABOVE: Rock damage on a victim’s vehicle. submissions and Crime Stoppers’ actions, and reviewed computer aided dispatch (CAD) tasks. “The NPT reassured the public by attending local schools and having a continuous presence in the areas of most activity,” SC1C Allison said. The NPT reassured the public by attending local schools and having a continuous presence in the areas of most activity. SC1C Scott Allison monitors traffic travelling under bridge 13 on the Southern Expressway. Photo: SAPOL Photographic Section. SC1C Robert Poole and PD Kira keep their eyes on the ball in their quest for success. Photo courtesy New Zealand Police. Police Dog (PD) Ruger has proven that every dog has its day, by unleashing his talents alongside handler Senior Constable First Class (SC1C) Craig Charles to achieve success at the Australasian Police Dog Championships. SC1C Craig Charles and PD Ruger lead the way at the Championships. Photo courtesy New Zealand Police. MAIN PHOTO: The scene of the unprovoked assault at Pooraka. BELOW: Jayson Doelz. Photos: MCIB and Forensic Response Section. A VIOLENT AND SENSELESS DEATH Forcefully placed in a car boot, a terrified 27-year-old father spends around 30 kilometres screaming, protesting and desperately trying to escape the clutches of his tormenters. fter successfully manipulating the boot lock, he leaps from a moving car and sprints for freedom down a roadside embankment where he is set upon by two of the car’s occupants and savagely attacked and murdered. On 26 May 2016 detectives searched a Pooraka address which had been identified as the location where the initial assault had occurred. BELOW: Convicted murderers (left to right) Chad Badcock, Kym Barnes and Shane Muckray; MCIB members at the Kersbrook crime scene. Photos: MCIB. prosecution by the Director of Public Prosecutions in return for their evidence,” Detective Brevet Sergeant McLean said. On 26 May 2016 detectives searched a Pooraka address which had been identified as the location where the initial assault had occurred. The investigation continued over several months until MCIB detectives arrested three offenders on 2 September 2016 after the two witnesses provided statements. Chad Badcock, 31, Kym Wayne Barnes, 32, and Shane Matthew Muckray, 28 were arrested and jointly charged with Doelz’s murder. “The trio was part of a close group of people who were involved in drugs and had organised crime links. Two of them had significant criminal histories,” Detective Brevet Sergeant McLean said. MAIN PHOTO: The Kersbrook crime scene. As they drove towards Kersbrook, the occupants sang along to the rap song “We Murderers, Baby”, ignoring their beaten, terrified victim’s pleas to be spared for the sake of his young son. OPPOSITE PAGE: A Ford Falcon boot; the murder weapon; Doelz’s bloodied sneaker and jeans; a blood-stained tree at the murder scene. Photos: Forensic Response Section. A PLACE THAT WILL Accessible ocean shores, vivid scenery, distinctive outback landscapes, natural wonders and a warm climate featuring more than 300 days of sunshine every year. It’s hard to believe this is all located only 396 kilometres northwest of Adelaide. But for police officers working in Whyalla, this is their daily life. prosecution. According to Eyre Western Local Service Area’s Operations Inspector Mark Hubbard, policing in Whyalla and metropolitan Adelaide is quite similar. “Like most communities, Whyalla experiences crime issues and challenges such as domestic violence, and volume crimes associated with drugs and alcohol,” he said. MAIN PHOTO: Inspector Mark Hubbard at Point Lowly Lighthouse in Whyalla. OPPOSITE PAGE (TOP): Probationary Constable Tor Butler and Constable Sophie Matthews interact with local children. Photos: Brevet Sergeant Colin White. ABOVE: Constable Kaya Air and Tor Butler with Sanjeev Gupta. a new $45 million hotel on the foreshore and a $6 million green organics recycling plant are also in the pipeline, heralding a renaissance for the Spencer Gulf region. Constable Sophie Matthews has witnessed the rebirth of the once struggling town, after arriving in Whyalla in 2016 for her first posting after graduating. Constable Sophie Matthews and Probationary Constable Tor Butler enjoy the Whyalla sunshine. Photo: Brevet Sergeant Colin White. ABOVE: Constable Matthews meets a local dolphin. IN ITS TRACKS Keeping the community safe is definitely in the train of thought of Public Transport Safety Branch, with new security initiatives and a highly visible police presence being just the ticket for reducing crime on the public transport network. saturating stations and interchanges, giving offenders little chance to evade police. “Operations often catch people with outstanding crime occurrences and warrants. Officers are equipped with fingerprint scanners which assist in catching people who lie about their identity,” SS1C Heyward said. “We recently ran Operation Northern over four Thursday nights at Elizabeth City Centre, Elizabeth Railway Station and Salisbury Interchange to deal with a range of issues. Operation Raise was then carried out in conjunction with Southern District, targeting incidents on the local tram line and surrounding suburbs. “The Branch also regularly uses foot, mobile vehicle and bicycle patrols, along with trail bikes to alleviate crime issues on public transport corridors.” The Branch’s work has been supported by DPTI’s investment in additional mobile security patrols, new hi-tech CCTV cameras, and improved lighting and emergency contact points at railway stations and interchanges. There is also a security hub staffed by Wilson Security that provides 24/7 monitoring of the public transport system. Close collaboration with DPTI continues, including direct access to DPTI’s incident data to further strengthen police intelligence. “These initiatives combined with our policing efforts have seen the total number of crime occurrences drop well below the three-year historical average, particularly for offences such as graffiti, property damage and missile throwing,” SS1C Heyward said. Constables Hayley Milligan and Kate Blundell at Adelaide Railway Station, and opposite page, with a Rail Operations team member. OPPOSITE PAGE (TOP): Brevet Sergeant Peter Williams assists a train commuter. Photos: SAPOL Photographic Section. A trail bike rider monitors a graffiti hotspot on a transit route. Photo: SAPOL Photographic Section. Graffiti and vandalism are a constant problem along transit routes throughout metropolitan Adelaide. he writing is on the wall for graffiti vandals with SAPOL joining forces with DPTI and Crime Stoppers SA to combat graffiti and vandalism attacks on the state’s public transport network. The anti-graffiti initiative includes rewards of up to $1000 for people who provide information that leads to a conviction for a graffiti-related offence on all types of public transport and associated infrastructure. A comprehensive public awareness campaign has also been rolled out on the Seaford train line to tackle the scourge of vandalism that costs taxpayers around $800 000 per year. Running until June 2019, the campaign involves signage at 23 stations, targeted social media advertisements, posters on-board buses, voice announcements at stations, and information across other digital platforms. SS1C Heyward said graffiti and vandalism are a constant problem along transit routes throughout metropolitan Adelaide. “Often the seriousness of the offending goes beyond simply marking graffiti, and includes vandals even attempting to stop, delay or disable trains, putting commuters at risk, or being aggressive toward those who challenge them while marking graffiti,” she said. A RANDOM ACT OF KINDNESS Driving along Main North Road at Blakeview on a sunny October morning, an off-duty Senior Constable First Class (SC1C) Narelle Bache noticed an elderly gentleman hobbling along the gravel verge. upported by his walking stick, he shuffled along the road with cars whizzing past in the 90km/h zone. Concerned for his welfare, SC1C Bache felt the need to stop. “The traffic was busy and quite dangerous for pedestrians. I couldn’t just drive past and let him struggle along so I did a u-turn and pulled up behind him,” she said. The compassionate officer approached the smartly dressed man and offered him a lift home. While doing so, she enquired into his welfare and his reasons for being in a precarious location. SC1C Liane Scutter, Sergeant Judith Robinson, SC1C Narelle Bache and Senior Constable Emma Radinovic with Tony Duffy at Smithfield Memorial Park. Photo: Steve McCawley, courtesy Police Journal (Police Association of SA). It’s never been my aim to win awards, however I’m extremely honoured to win this prestigious award. Brevet Sergeant Fred Keal celebrates his win with wife Suzanne and daughter Rebecca, and left, at the award presentation. Photos: SAPOL Photographic Section. After 15 years as a police officer in England Brevet Sergeant Fred Keal moved to South Australia seeking a fresh challenge. A decade later the talented and well respected police prosecutor was crowned 2018 South Australia Police Officer of the Year. sophisticated billy carts raced down Macclesfield’s steepest hill to benefit various charities, including Novita and the Williams Syndrome Association. “I admit establishing the Macclesfield Gravity Festival was a childish desire to race home-made billy carts down a hill but the charity work that has arisen from it with the Lions Club and my work in the CFS is really a celebration of how lucky I am,” he said. “To live in Macclesfield, with a great job and loving family, is a real privilege and it would be rude to squander it when I can do a bit in my spare time to help others.” The married father-of-three has a strong commitment to spreading joy and community spirit. Each November and December, Brevet Sergeant Keal turns his trailer into a sleigh and, dressed as an elf, assists Santa Claus as he visits the district’s major townships, complete with six white boomers on the roof of his car. In 2017, he masterminded the Lions Classic Bike Show, which drew around 1500 people to Macclesfield Oval, and raised $10 000 for the Lions Club to donate to a range of worthy causes. Officers plan during a training exercise. Photo: SAPOL Photographic Section. A terrorist enters the Adelaide Entertainment Centre (AEC) and plants a backpack containing a chemical dispersion device in a rubbish bin. Disturbed by staff, he then starts shooting, leaving up to 20 victims either dead or seriously injured, before taking six people hostage. olice and emergency services rapidly respond to the mass casualty incident while explosives experts and negotiators proactively assume their vital roles. Fortunately this horrifying situation is just an element of Exercise Neighbour 18, a three-day counter-terrorism simulation involving police and emergency services from South Australia, Western Australia and Commonwealth national security agencies. Held from 20 – 22 November 2018, the activity provided a valuable opportunity to test and rehearse national and state arrangements in the event of a terrorist attack. “It’s essential that SAPOL and other agencies are adequately prepared in the event of a terrorist threat or incident,” said Assistant Commissioner (AC), Security and Emergency Management Service, Noel Bamford. “Regular counter-terrorism exercises such as Neighbour 18 emphasise the importance of multi-agency and multijurisdictional cooperation and interoperability. “They also ensure SAPOL is well placed to effectively manage and respond to any threat to community safety.” South Australia is not immune to the evolving threat of global terrorism. ABOVE: Planning and operational scenes from Exercise Neighbour. Photos: SAPOL Photographic Section. The exercise has provided a timely reminder of the terrorism threat environment and the need for police to be vigilant and prepared. STAR Operations members and a Bomb Response Unit member (opposite page) prepare for the exercise at Plympton. Photos: SAPOL Photographic Section. A FAIR DINKUM WAY OPPOSITE PAGE: Senior Constable First Class Julie Jones discusses the Travel Safe guide with a tourist at Adelaide Airport. Photo: SAPOL Photographic Section. The safety campaign is not just aimed at backpackers, but a wide range of visitors to South Australia. Visitors to South Australia who are looking to do some “hard yakka” while “goin’ bush” or just “gettin’ a lift” are the beneficiaries of a new travel safety campaign launched by SAPOL. ABOVE: The evolution of bicycle patrols from North Terrace Barracks in May 1915 to the Tour Down Under in January 2018. RIGHT: A police bicycle dispatch rider in the early 1950s. BELOW: Alfred Samuel Cottell in 1940.
seat, the model became standard issue for around 70 years. By 1916 the number of police bicycles had grown to 100 for a police force of 352 members, with bikes progressively issued to most police stations. This increased to 133 bicycles in 1943 before their use diminished from the 1950s onwards, with bikes mainly used for special operations. In 2000 a new cycle began, with uniform bicycle patrols introduced to complement regular mobile police patrols. Today, bicycle patrols are used for high-visibility policing to detect and prevent crime and are deployed at special events. More than 80 officers are qualified to ride the 30 bikes available across the four metropolitan Districts and Public Transport Safety Branch. Retired Commissioner Mal Hyde with bicycle patrol members at the launch in 2000. Northern District members patrol the Royal visit at Elizabeth in April 2014. All photos: South Australian Police Historical Society and SAPOL Photographic Section.